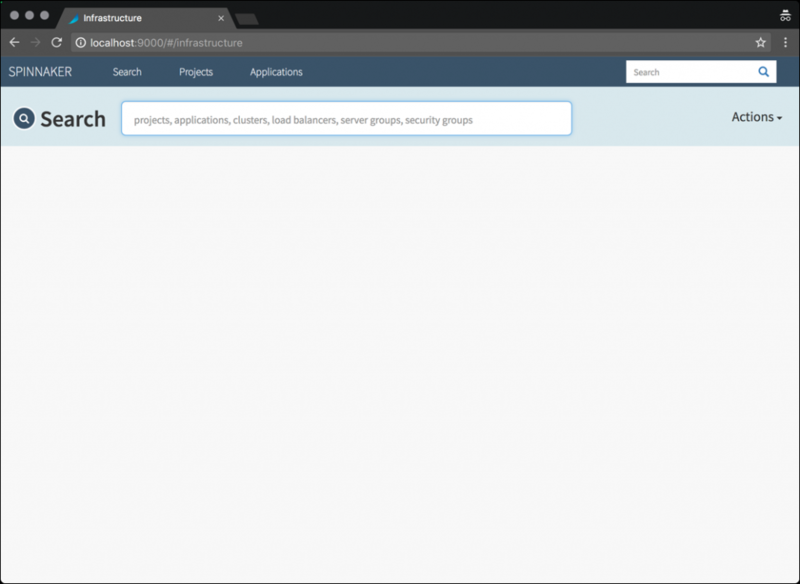 The application used in this tutorial is a static HTML page designed for visually differentiating the builds. 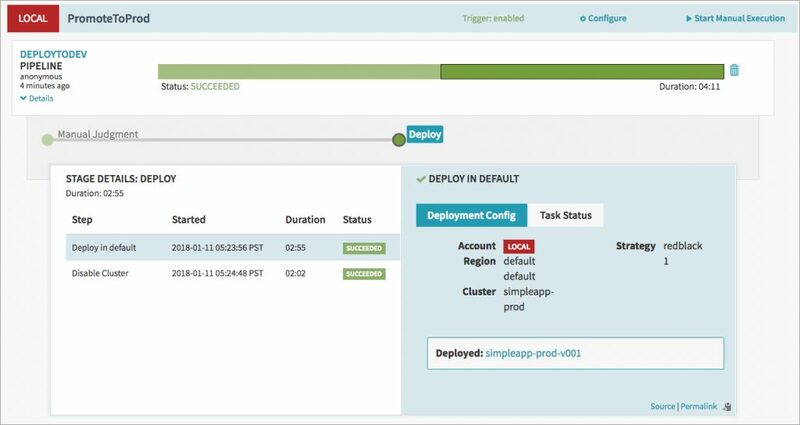 It has a master branch that contains production-grade codebase along with a dev branch. 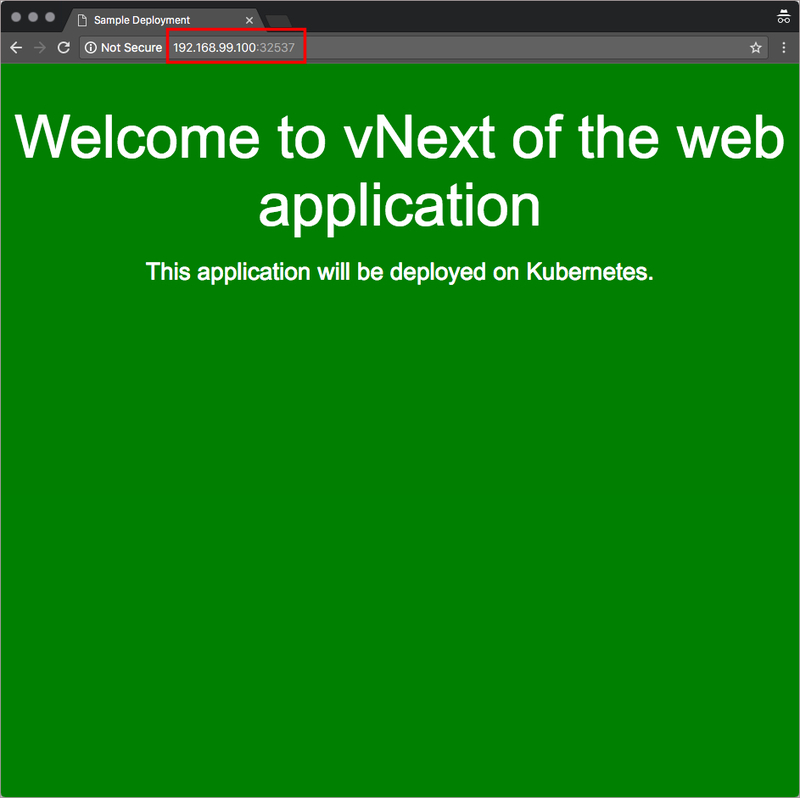 Start by forking this repository and then connect it to Docker Hub. 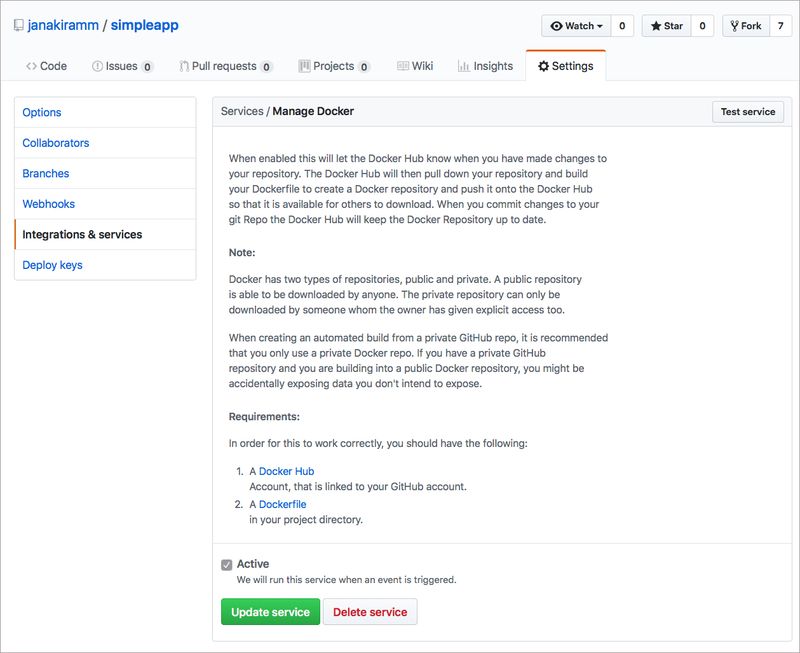 Refer to this guide from Docker documentation on integrating Github with Docker Hub for automated builds. 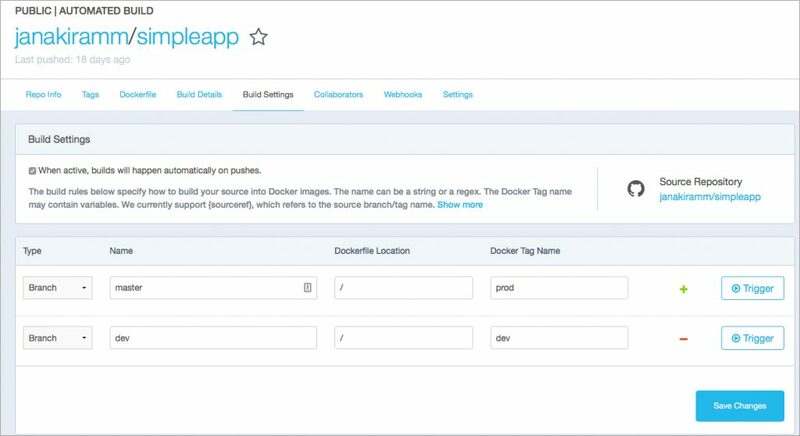 The master branch of the repo is configured to build a Docker image with tag prod while the dev branch will generate an image with the dev tag. 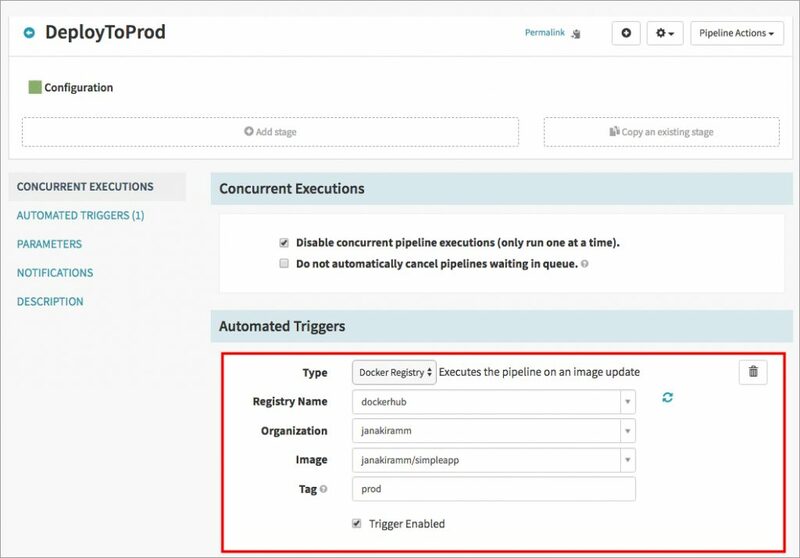 Each time you perform a commit to Github repo, Docker Hub will kick off an automated build process resulting in new images. 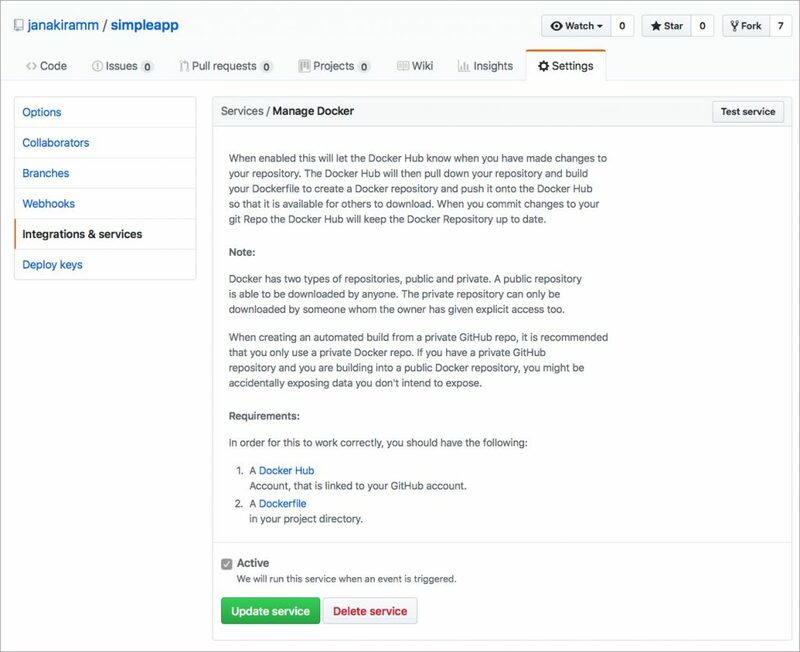 Once Github and Docker Hub are integrated, we need to configure Spinnaker to talk to Docker Hub. 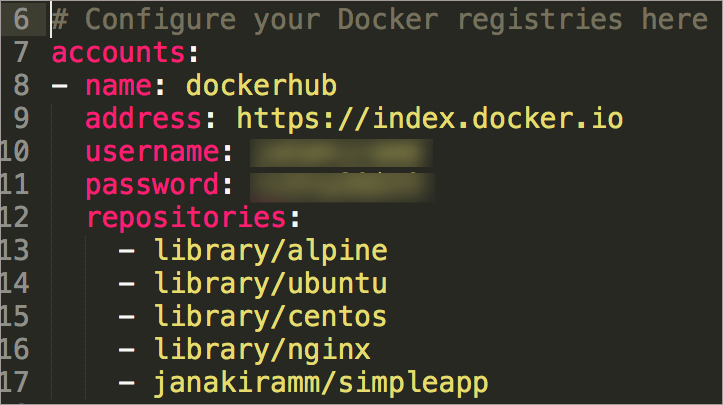 We do that by modifying the configuration file, values.yaml to add Docker Hub credentials. 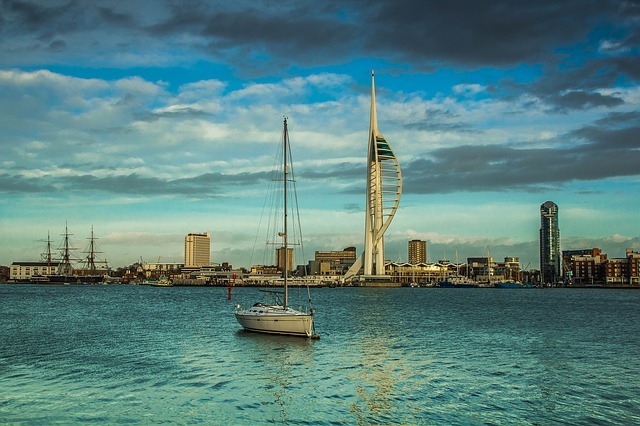 Spinnaker can now be accessed from the browser by visiting http://localhost:9000. 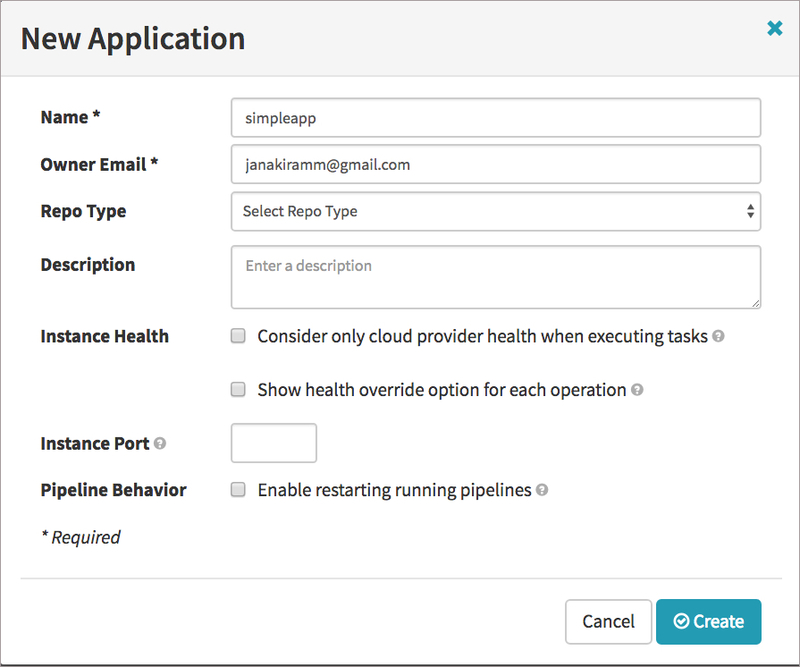 Let’s start by creating an application called Simpleapp. 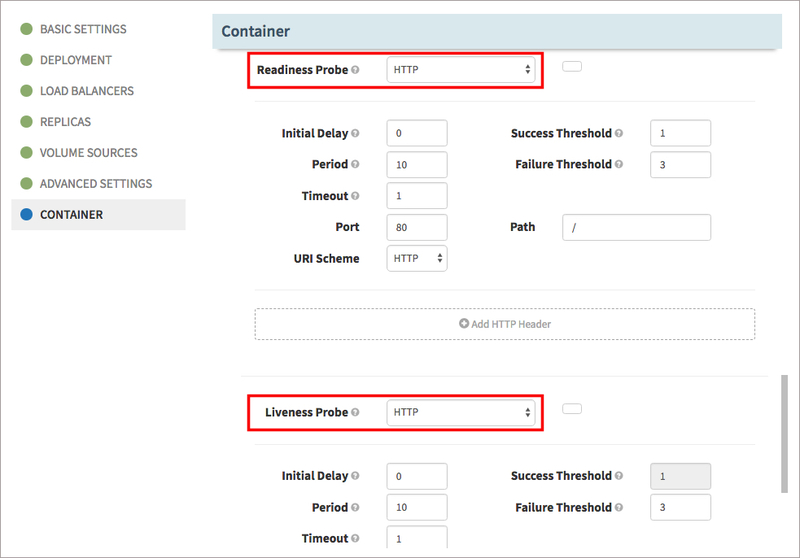 The production app based on the prod branch will be exposed through the first Load Balancer on a NodePort while the dev build will be available internally for testing through the second Load Balancer. 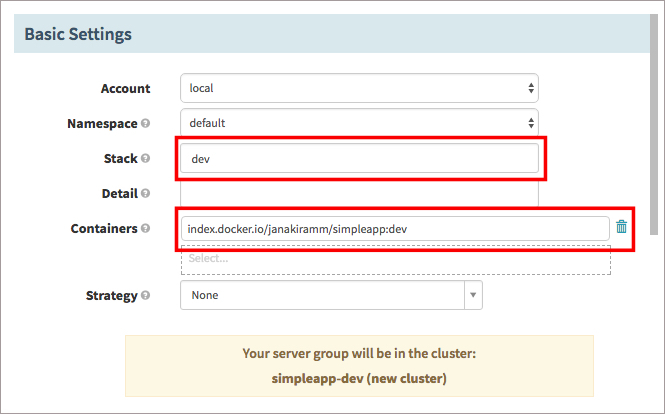 Choosing ClusterIP restricts the visibility of the dev build. 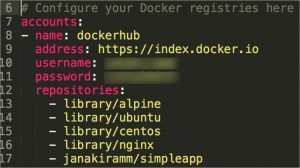 Under Automated Triggers section, choose Docker Registry as type, dockerhub as Registry Name, your Docker Hub username as Organization, Image as <DOCKER_HUB_USER>/simpleapp, and prod as Tag. Ensure that the Trigger Enabled is selected. 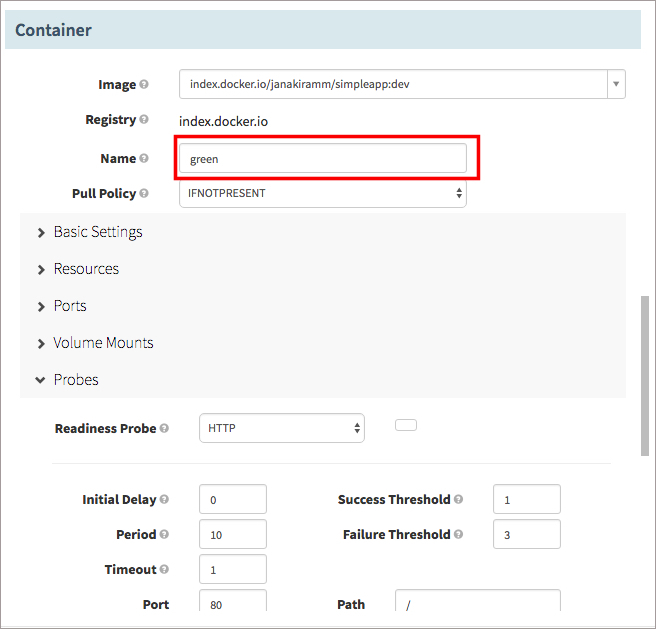 This configuration would automatically trigger Spinnaker pipeline each time Docker Hub builds a new image. It’s important to note that the trigger wouldn’t work for tag latest. That’s the reason why we chose dev and prod as tags for our simpleapp image. 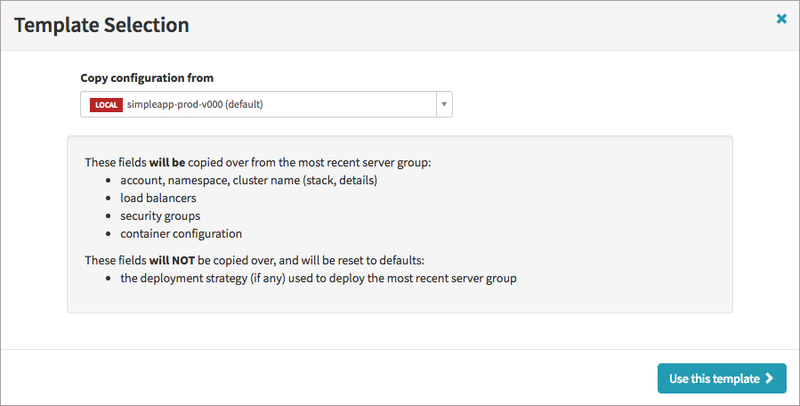 Click on Add Server Group and select Continue with a template when prompted. Go back to the Github repo and make a change to the code in the master branch and commit it. 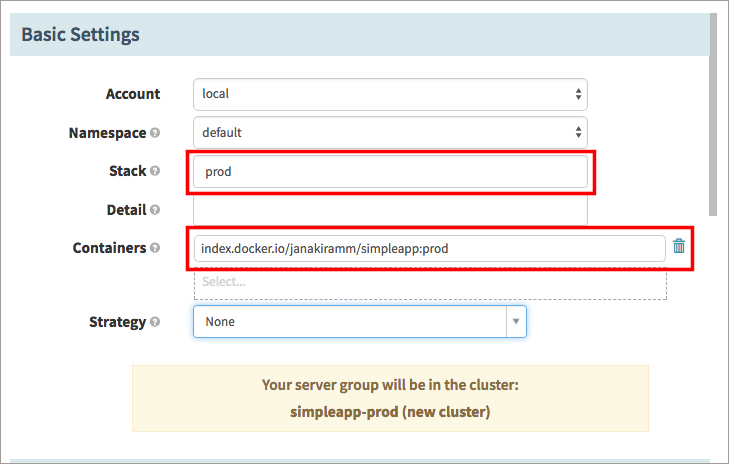 This will trigger Docker Hub build process resulting in a new image. 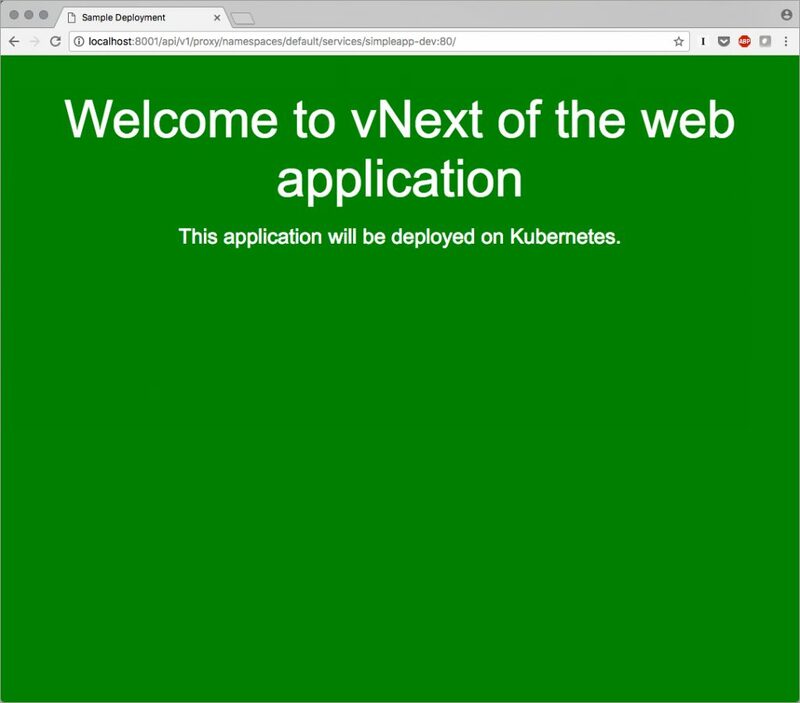 We now deployed the application in the production environment. 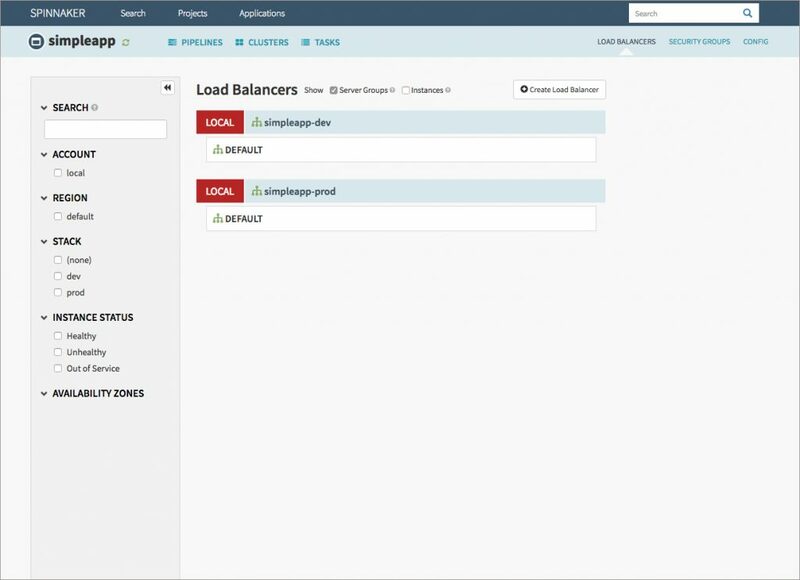 Let’s build another pipeline to deploy the app in the development environment. Add a new stage and choose Deploy as the type. 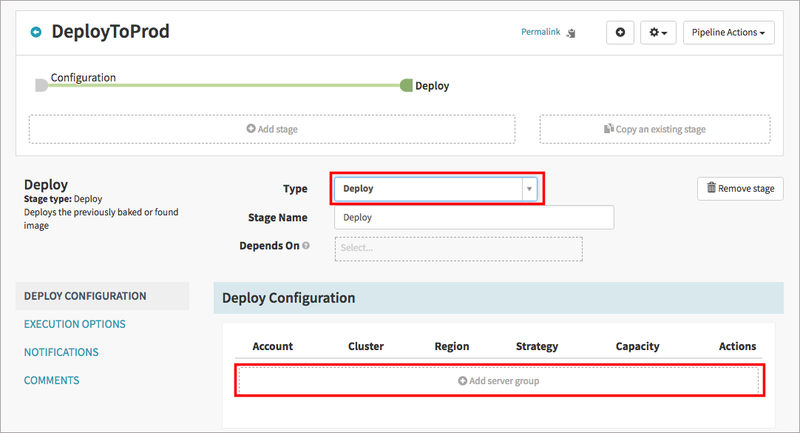 When you are adding a server group under Deploy Configuration, choose simpleapp-prod-v000 from the list. 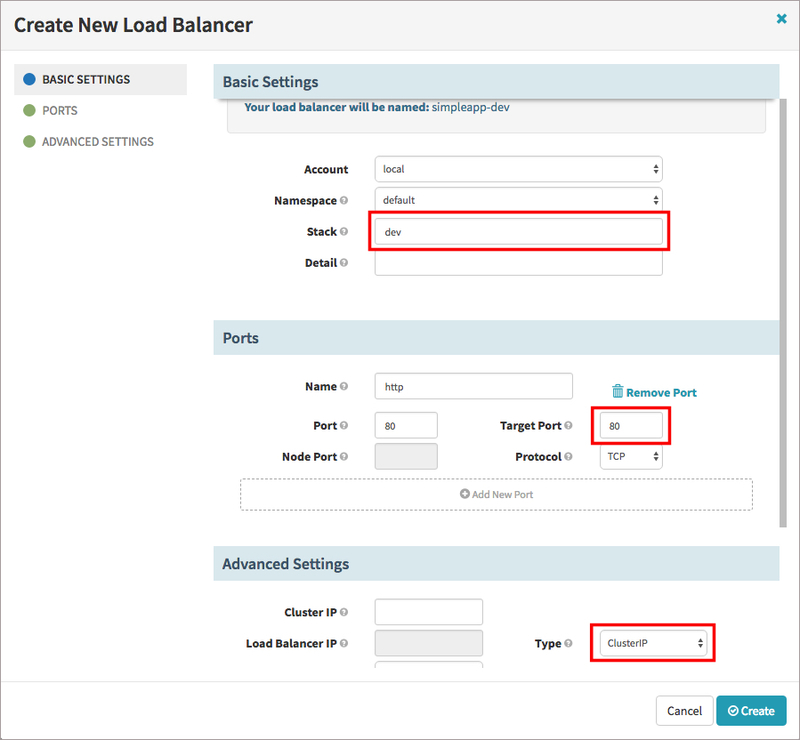 Change the stack name to dev. Make sure you delete the existing image with tag prod and add a new image with dev tag. 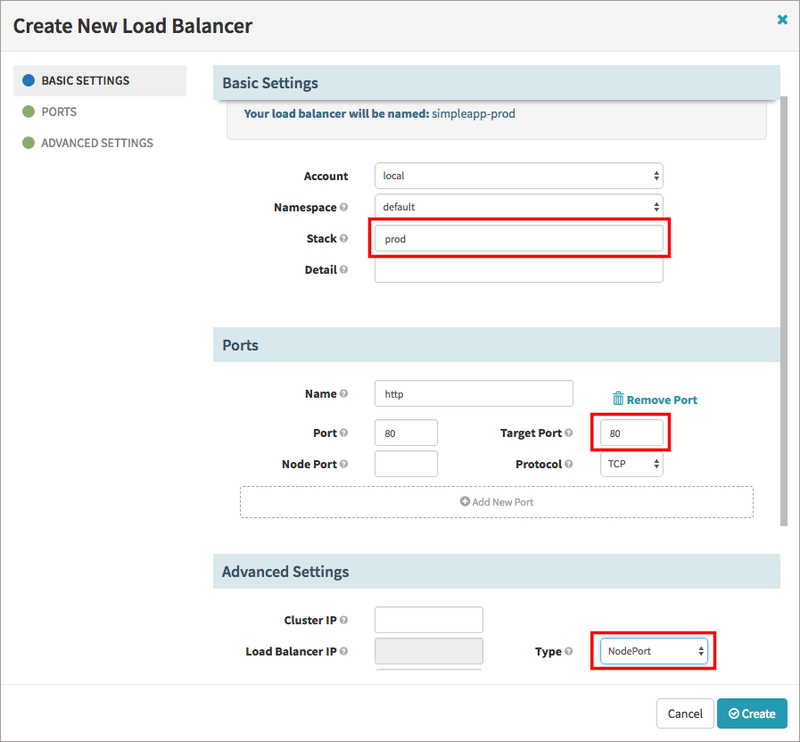 This will ensure that the dev image is deployed to a different Server Group. Go back to the Github repo and make a change to the code in the dev branch and commit it. This will trigger Docker Hub build process resulting in a new image. Now it’s time to create the final pipeline to promote dev build to production. We will use manual judgment to push the dev build into production. 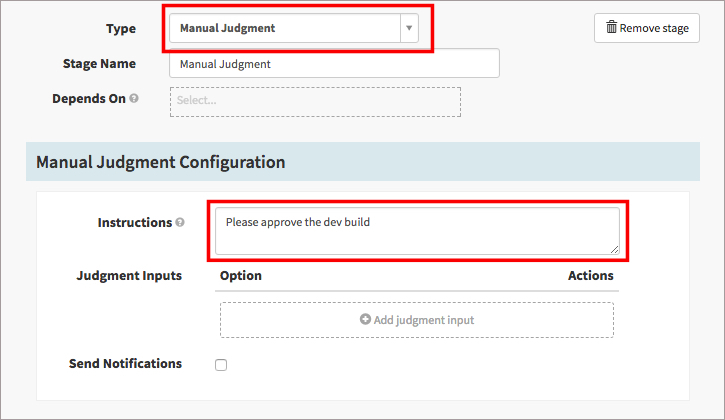 This option will prompt to approve the dev build before promoting it to the production environment. 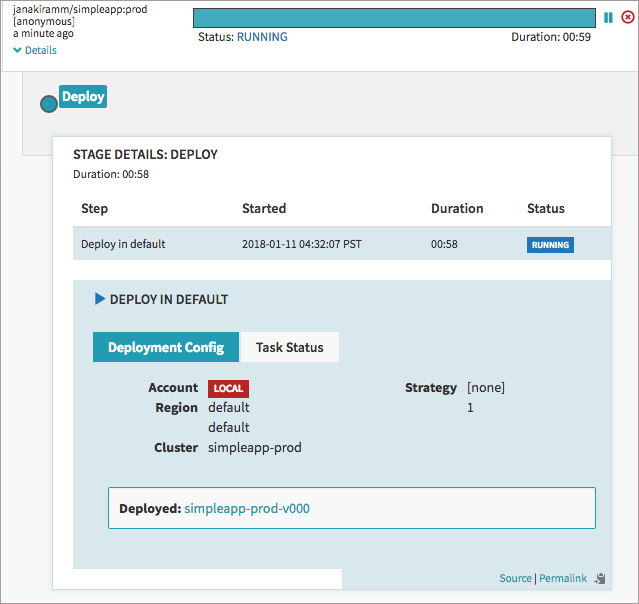 In the next step, we will create a deployment stage to replace existing production environment with the dev build. 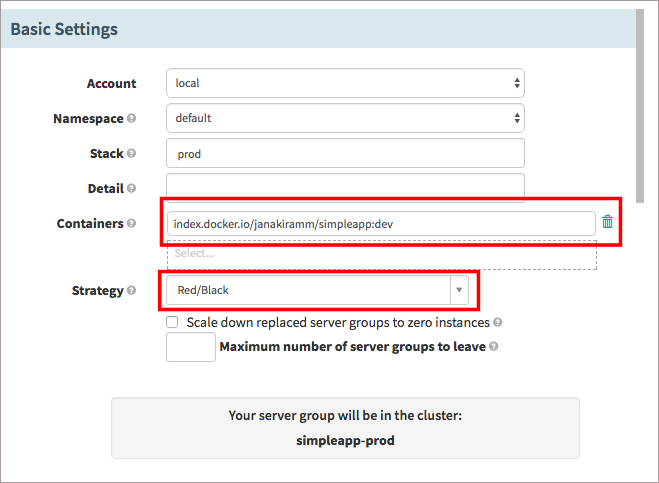 Choosing Red/Black will disable the previous Server Group as soon as the new Server Group becomes ready. Make changes to the dev branch in Github and commit it to trigger the entire workflow. After a few minutes, you should see the prompt to approve the build. Congratulations! You have successfully promoted the latest build to the production environment. Please visit our landing page for other posts in Janakiram MSV’s series on Learning Spinnaker.